Mac OS X v10.4 or later. Now fully compatible with Mac OS X 10.6 (Snow Leopard). Support for Karaoke CDG files (mp3 + cdg files), FLAC support, Vestax VCI-100 support, lots of stability improvements and several small bugs fixed. Posted by Anonymous on Tue, 11/22/2011 - 02:13. Is there anyway I can burn them in MP3 format? The Best DJ Software for Mac OS X and Windows. Posted by jane doris on Fri, 08/26/2011 - 09:27. Costa Mesa, Calif., (August. 26, 2011) – DJMixersoft, Inc., creators of DJ Mixer Pro, the DJ mixing software made especially for Mac, today announced the availability of DJ Mixer Pro featuring full compatibility with the latest released OS X Lion 10.7 operating system after the full test by DJMixerSoft’s technicians. Few crash were found during numerous installation and launching, This powerful DJ software combines an easy-to-use interface makes mixing your favorite music on Mac Lion easy. supports automatically mixing your song from iTunes 10.4. Besides, It also supports the Mac OS Lion features of Full-Screen Apps, Mission Control, and Multi-Touch Gestures. 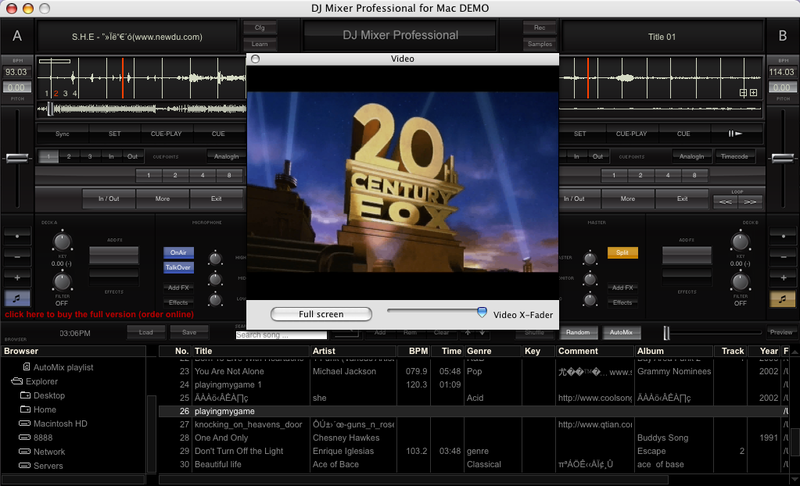 It is that easy and enjoyable to operate DJ Mixer Pro on Mac OS X lion. DJ Mixer Pro provides many advanced features for pro DJs and VJs, radio and TV stations, such as restaurants, hair studios, discos and hotels. DJMixersoft, Inc. is one of the world’s leading providers of DJ Mixing software. DJMixersoft products are designed by professional DJs and audio engineers, It has become the premiere Mac-based DJ and broadcast automation system used in over 130 countries worldwide.